House and time at Malvern: No 7, 1909 - 1913. Died: 11 March 1916 aged 22 in France. Died of wounds at Boulogne. Born: April 13th 1894. Son of William Stewart Morice (O.M. ), and Laura Morice, of 8, De Vere Gardens, Kensington, London, and 5 Avenue Mansions, Willesden Green. Native of Ricksmanworth, Herts. Lower IV—Lower Modern I. School Prefect. XI Cricket; XI Football 1912,13; Ledbury Cap. Great War, 2nd Lieutenant 7th Bn. East Yorkshire Regiment. 1914 Lieutenant. 'Norman Morice, like all the members of his family, entered with the keenest zest into all branches of school life. A good worker, of a disposition which endeared him to everybody, masters as well as boys, good at games, he will be mourned by all with whom he came in contact. He was at home on leave only a few weeks ago, and seemed most keen on his adopted profession. Very soon after his return he was seriously wounded, but his letters were cheerful and bright, and made light of his injuries, so that all his friends were unprepared for the sad news of his death. He was a keen member of the Choir, having, when he first came, a very good treble voice. He sang many solos in Chapel and at School Concerts. He was intended for a business career, but on the outbreak of war joined the 7th Bn. E. Yorks Regt., in which regiment we learn from his Colonel he was one of the most promising officers.' (Malvernian, Apr 1916). 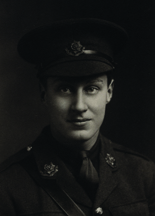 On 23rd November 1915, he was admitted to St John's Hospital, Etaples with influenza. On 27th February 1916, he was severely wounded with a gunshot wound to the right thigh and compound fracture, and he died on the 11th March 1916 at No 7 Stationary Hospital, Boulogne.